Hi Dr. Debs. The reason I’m gravitated to your blog is that you give good information, good advice, you have a viewpoint and I get onto your blog and want to read more. I believe that you have a good formula here. You’ve never left me in the dust and I always know what’s on your mind. The one term I see frequently in tasting rooms is “Chewy”. Huh? I’m not bashful, so I ask the pourer for his definition and see if the wine follows his definition. We all have words we don’t know. I use www.onelook.com to get them defined as well as www.wikipedia.org. I believe I would fall into a similar pattern as you identified: as little jargon as possible, mostly dialect, and some idiolect. BTW, thanks for defining these for us (Even though I fancy myself a bit of an amateur linguist, I would have categorized them all as jargon). While we write to share our tasting experience with others, we can best interpret what we sense with language that comes from our own experience. If I come from a rural place, I may be able to describe a wine as having the smell of freshly cut hay. If I am a New Yorker I may say that another wine smells like pretzels from a street vendor. When reading or tasting with others, we may encounter a new word that seems to hit the nail on the head describing a particular flavor that may have eluded us. Our jargon and dialect is rather specific and we each expand the idiolect every day. While it is important to know which sail is which if you want to keep the boat afloat in a storm, I always need to keep reminding myself that I am Evangelical Wino. It is my calling to convert the seekers - to get people who may not know the lingo to get excited about the wines I describe, taste on their own, and share what they find with others. In my enthusiasm for sharing what my brain has interpreted from my senses, I often must remind myself that I want readers to easily understand...and come to believe. See, one of things that draws me to wine IS the jargon. I admit that it made the learning process more of a hurdle, but I love the unique intersect of language and wine that is the tasting note. If you agree that wine tasting is a subjective experience, and that all subjective experiences are in some ways ineffable, then the wine tasting note is a miraculous thing, when it's comprehensible. The quandary lies in combining accurate expression with maximum comprehension, don't you think? Like in poetry? Of course, so much of wine education is instruction on wine language. I suppose it could be said that we have too much jargon, but how else to describe a scent or taste in words? And is there a better way to discuss the complexity of farming and fermentation? For the record, I admire how your tasting notes are largely seamless from your overall review. There's no big flashing sign saying "JARGON BEGINS NOW," or even "IDIOLECTIC SPEECH ENDS HERE." That's one thing that makes your blog unique -- it's elegant, yet down to earth; informative, but not even remotely dogmatic! Thank you Deb for the characterization -- very useful to a writer (such as me). You say "I try to use as little jargon as possible, but I use a lot of wine dialect and I'm sure some idiolect, too." I would say the same. Yet there is some dialect that doesn't help since it is misleading -- such as 'fruit' or 'terroir'. I try to use separate terms depending on the meaning: I translate 'fruit' by either impact or flavour intensity; I translate 'terroir' by either earth or appellation typicity. I _try_ to "combine accurate expression with maximum comprehension" as Wine Scamp put it. I like how Wine Scamp likens tasting notes' comprehension combined with accurate expression to poetry. Because that is exactly what I do every week at Rosenblum when I change the menu. Attempt to create little scenes--how I once did in my poetry--so that people can understand the moment in time that wine brought me to when I tasted it. Whether they agree or not. I always love when people come up with descriptions that are personal and real. Some memory that comes back with one whiff. Whether it's me going back down the river on a hot Montana afternoon or some lady in the tasting room who remembers her grandfather's study. That's what wine is all about to me. It's even harder to express in words what I'm not sure I'm tasting, as a wine newbie! I think wine words are very useful, even if I've never tasted "lichi" or "cassis". I can ask the writer what they mean and when I do encounter it, I've got a word to use to express it. Wine Scamp, the second paragraph in your post is almost a work of art! I wish I could write like that. "Words can't touch the soul of a wine." The jargon can get tiresome, but in the hands of poets and true wine lovers it can be very beautiful and helpful. thanks for the wording definitions. 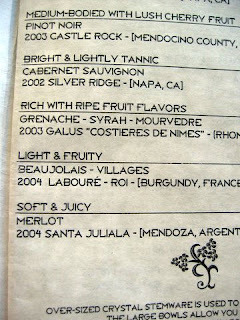 I completly understand how some readers can be confused by terms used by wine writers. I work in Sensory Research for a consumer goods company and matching terms that expert panelists use with "consumer terms" is a task in itself, one that many conference presentations have been done on. I personally just right what I feel, taste, etc with whatever words that come to mind when I jot my tasting notes in my little black book. I think that when I am speaking to someone in person I adjust my language depending on my percieved wine knowledge of the person I am talking with. thanks for the post, fun and thought provoking. Thanks to you all for the terrific feedback and links to wine term definition sites. I think Felicien is right that part of the problem with wine dialect is the mushiness that can come into play with terms like fruit. And as for terroir--some would say that was jargon, others dialect. Whole articles have been written on whether terroir is a real technical term or not. You've all given me more to think about with regards to this issue.